My Erfurt 1917 Kar A, for what it may help. 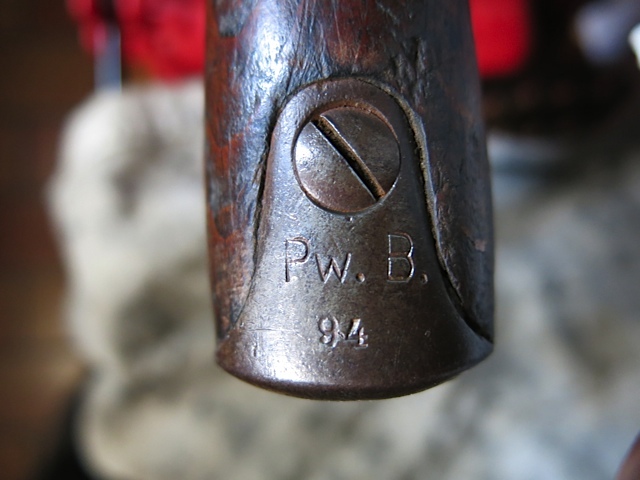 Recently sold on Ebay: Soemmerda S84mS, 1891, notched pommel, deactivated latch, 1920 and PwB, with unmarked scabbard. In rough shape but an extraordinary combination. I assume you are talking about this one. Well, somebody murdered the blade. Would love to find something like that! PS: somewhere I have a photo showing a Bavarian Police officer with SG 84/98 with V-notched pommel. Need to dig it out. Last edited by Amberg; 02-25-2015 at 02:21 PM. Blade murdered indeed. Proves the adage: " If it is collectible Bubba will bugger it."